Now with added spooky Mausoleum announcer. A new update for Cuphead has addressed a myriad of issues plaguing the retro platformer, including the inexplicable controller disconnection/reconnection error. "We've been hard at work over the last couple of months squashing bugs, fixing exploits, and even doing a little bit of gameplay balance tuning," states the update post. "Thank you all for your patience, kindness, and support. We wouldn't be here without you." "There’s not a whiff of cynicism about Cuphead: from its aesthetic to its systems, it’s wilfully off-trend, and utterly its own thing," we said in our Cuphead review, in which we awarded the game an impressive 86. "As tough as it gets, ultimately that’s what’s really worth shouting about." 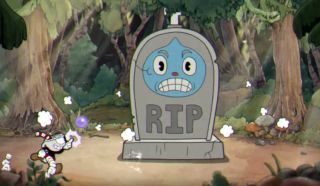 YouTube channel 64 Bits recently reimagined many of Dark Souls' most memorable bosses with a Cuphead-esque animation style.